Street stalls and kiosks – is often dust, dirt, poor sanitation, heat in summer and cold in winter, peeling walls and leaky ceilings. And while street kiosks – the person of the city. 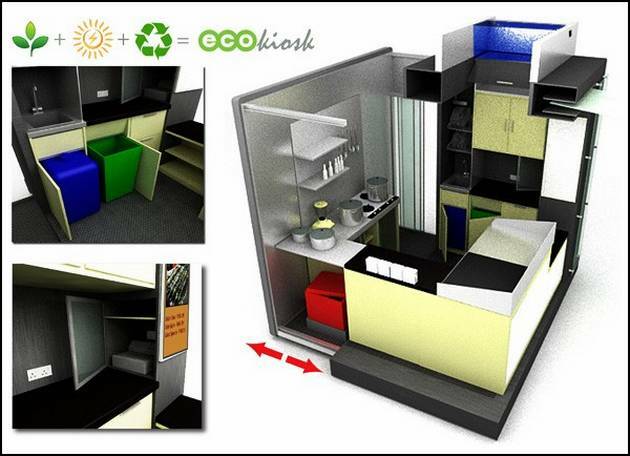 Obviously, the face of the city of the future must somehow differ from the face of this bleak – just for this and invented a kind of “stall dream” – a new kiosk with ecotechnology which is called – Ecokiosk. Formula derived by London Bizarreka Design, is simple: the new kiosk = green plant + solar energy + recycling . To save the solar energy will provide a translucent roof of the kiosk: at least a day does not require lighting in addition, Self-venting the roof – the sellers, sometimes almost suffocating in summer, will appreciate it. Also on it are mounted solar panels, which have enough energy to light a stall at night. The whole shop is made up of materials, or obtained through secondary processing, or designed for it. First of all, this is a special plastic, mounted on a lightweight metal beams. 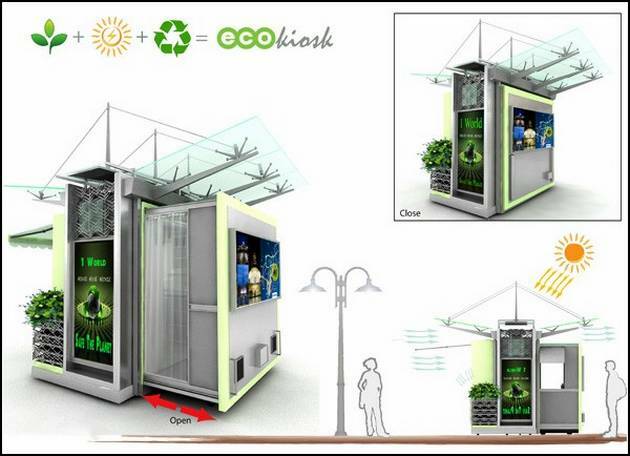 “The new kiosk also try to alleviate the problem of carbon dioxide, from which choked cities: from all sides stand around hanging pots and flower beds with avtopolivom systems. Even the water for this irrigation will be possible to stock stall itself: it is proposed reservoirs to collect rain water. According to his new shop interior resembles a small “food service establishments”, which is preparing a national Russian dish – shaurma. Perhaps such larechki with shawarma would be much nicer than today’s – and for buyers and sellers. But at the environmental kiosk is a minus: he is clearly not designed for the harsh winter. In our country, the optimal zone of its location – south of the city at the height of the holiday season: the more so for the resort towns of important “to keep the brand of” beauty and freshness of all buildings. Approaching the Sochi Olympics-2014 – maybe it’s time to think about how local people will feed a crowd of foreigners?